With the lack of people capable of turning written or spoken words into sign language in Belgium, University of Antwerp masters students Guy Fierens, Stijn Huys, and Jasper Slaets have decided to do something about it. They built a robot known as Aslan, or Antwerp’s Sign Language Actuating Node, that can translate text into finger-spelled letters and numbers. 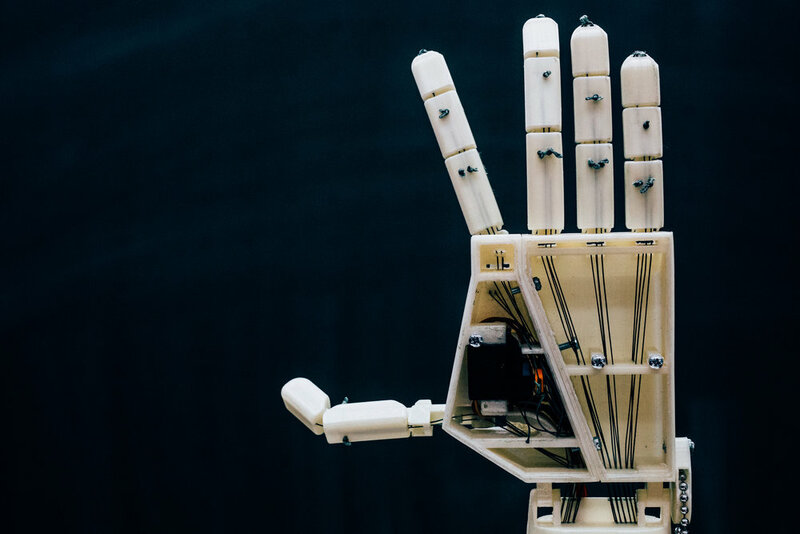 Project Aslan–now in the form of a single robotic arm and hand–is made from 25 3D-printed parts and uses an Arduino Due, 16 servos, and three motor controllers. Because of its 3D-printed nature and the availability of other components used, the low-cost design will be able to be produced locally. The robot works by receiving information from a local network, and checking for updated sign languages from all over the world. Users connected to the network can send messages, which then activate the hand, elbow, and finger joints to process the messages. Although it is one arm now, work will continue with future masters students, focusing on expanding to a two-arm design, implementing a face, and even integrating a webcam into the system. For more info, you can visit the project’s website here as well as its write-up on 3D Hubs. The flex sensors are ingenious, but probably not very reliable. They consist of a short flexible tube, an LED and a light-dependent resistor. We’re guessing a lot of factors could change the amount of light that goes around a bent tube, and that may be what’s wrong with the one finger in the video. We’d love to try this project using some conductive bag flex sensors. Although this hand doesn’t look like a gripper, we wondered if it could be used for sign language projects. How do you make a robot hand? If you are [Robimek], you start with some plastic spiral tubing, some servo motors, and some fishing line. Oh, and you also need an old glove. The spiral tubing (or pipe, if you prefer) is cut in a hand-like shape and fused together with adhesive. The knuckle joints are cut out to allow the tubing to flex at that point. The fishing line connects the fingertips to the servo motors. The project uses an Arduino to drive the servos, although you could do the job with any microcontroller. Winding up the fishing line contracts the associated finger. Reeling it out lets the springy plastic pipe pull back to its original position.The glove covers the pipes and adds a realistic look to the hand. Granted, this is probably more practical as a display piece than a working hand. We’d like to put it in our next Halloween project. We’ve seen some simple hand builds before, but the glove is a nice touch. For some reason, many of our robot hand projects like to make rude gestures. You can see a video of [Robimek]’s hand working below.